Throughout Wisconsin, chopped straw often is purchased as forage and used within diets of dairy cattle to provide additional fiber, and maintain proper rumen function. For replacement heifers, straw is used commonly to dilute the energy density of the diet, limit voluntary intake, and prevent over-conditioning, especially within diets constructed for pregnant heifers weighing >1000 lbs. Unfortunately, the use of straw has several well-known problems. It often must be purchased, and then processed, before it can be blended properly within total mixed rations. Chopped straw also is sorted routinely by replacement heifers, which complicates its use in production situations where (inadequate) bunk space prevents all animals from eating simultaneously. iii) greater proportions of crude protein (CP) that are associated with NDF (NDICP), and that bypass ruminal degradation. Recent research has shown that EGG haylage is non-sortable by heifers or cows, and could be a viable alternative to straw. This Focus on Forage report summarizes evaluations of the nutritional characteristics of EGG forages, and their use in diets of dairy heifers at the University of Wisconsin Marshfield Agricultural Research Station. 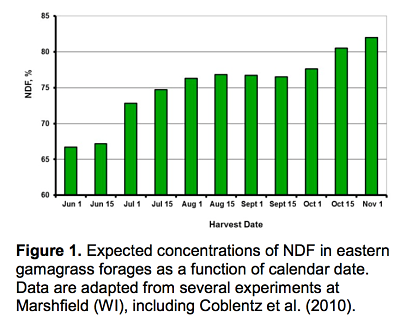 What Concentrations of Fiber (NDF) Can Be Expected in Eastern Gamagrass Forages? Based on work from several experiments, expected changes in structural plant fiber (NDF) for EGG over the summer and early-fall are summarized in Figure 1. Several common characteristics of perennial warm-season grasses are illustrated within this graph. First, concentrations of NDF are quite high (>66%) on June 1st, when EGG plants are still immature. This is a common characteristic of perennial warm-season grasses; routinely, these grasses exhibit very high concentrations of NDF, even when harvested at immature growth stages. Between mid-June and early-August, NDF concentrations increase with plant maturity; however, the magnitude of these increases is relatively small (about 10 percentage units). From our work, NDF concentrations ranging between 75 and 80% can be expected from a one-time harvest anytime between early-August and first-frost. Additional increases in NDF can then be expected if harvest is delayed beyond first-frost, thereby resulting in final NDF concentrations of >80%. Unlike cool-season grasses, NDF concentrations within leaf and stem tissues of EGG are virtually identical through the flowering stage of growth (Coblentz et al., 1998). Furthermore, research conducted in Kansas suggests that only about 20% of tillers actually elongate and produce a visible seedhead, while others remain vegetative (all leaf); therefore, the fibrous nature of EGG is highly associated with leaf tissue, and not just the stem. Another important characteristic of EGG is that fiber disappears or digests very slowly in the rumen of dairy animals. 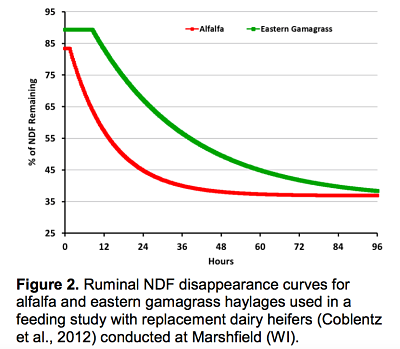 This is illustrated in Figure 2, where ruminal NDF disappearance curves for alfalfa and EGG haylage are compared based on data from a recent study in Marshfield with replacement dairy heifers (Coblentz et al., 2012). The calculated ruminal degradation rate for alfalfa NDF was 7.8%/hour, which was 2.3 times faster than observed for EGG (3.4%/hour). As a result, EGG can occupy space within the rumen for a longer time interval, which theoretically reduces voluntary intake and can be advantageous in dairy heifer or dry-cow diets. These concepts become even more obvious when ruminal disappearance of all forage DM is considered for these two haylages (Figure 3). The disappearance rate for alfalfa haylage was more than three times faster than for EGG (10.2 vs. 3.1%/hour); in addition, alfalfa haylage contains more internal compounds that are immediately soluble in the rumen. As a result, disappearance of DM from alfalfa haylage is nearly complete after 24 hours of ruminal incubation, but disappearance from EGG could continue steadily for four days if not terminated by passage from the rumen. After 24 hours of incubation, there was a 35-percentage unit difference in DM disappearance between the two haylages. It is important to note that these digestive characteristics for EGG are related to the internal structure and physiology of the plant, and are distinctly different from those of cool-season grasses and legumes typically used in dairy operations in Wisconsin. What Concentrations of Crude Protein Can Be Expected? Figure 4 illustrates expected concentrations of CP based on several studies conducted at Marshfield. Generally, concentrations of CP can be expected to decline in a quadratic relationship with harvest dates. During the time interval between August 1st and October 1st, which would encompass likely dates for a one-time harvest for hay or silage, concentrations of CP typically range between 5 and 10%, and are similar to expectations for corn silage, but marginally greater than cereal-grain straws. 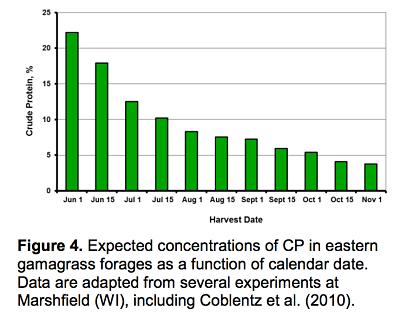 Within EGG forages, CP associated with the cell wall (NDICP) often accounts for more than 50% of the total CP within the forage; typically, cell-wall associated CP is more resistant to ruminal degradation, often resulting in greater estimates of ruminal bypass than those of cool-season grasses and legumes. 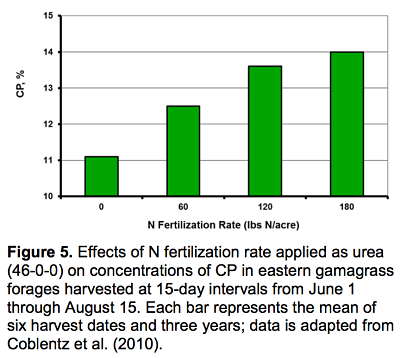 Concentrations of CP also are associated positively with N fertilization rate (Figure 5; adapted from Coblentz et al., 2010). Averaged over six harvest dates between June 1st and August 15th, concentrations of CP were 3 percentage units greater with a 180 lbs N/acre fertilization rate compared to unfertilized check plots. 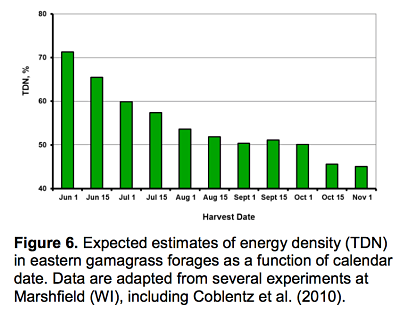 What Is the Expected Energy Density of Eastern Gamagrass Forages? 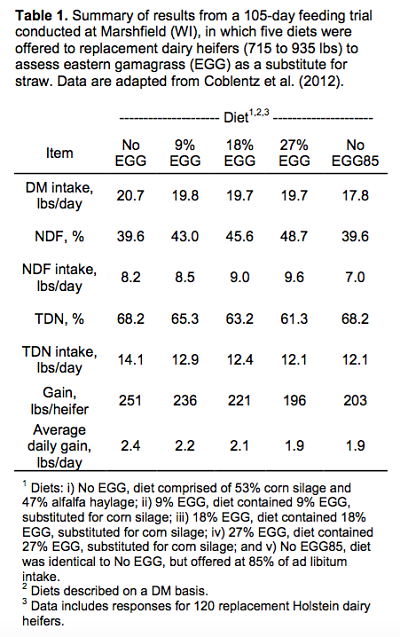 The energy density (TDN) of EGG forages can be expected to decline in a mostly quadratic pattern during the summer and fall. Our work suggests that TDN declines rapidly through mid-July, but then becomes relatively stable throughout August, September, and early-October. Following several frost events in late-October, we have observed an additional decline of about 5 percentage units of TDN. From these data, EGG forage obtained from a one-time annual harvest conducted between mid-July and mid-October can be expected to exhibit a feeding value of about 50% TDN, or a NEL of about 1.11 Mcal/kg (0.50 Mcal/lb), which is similar to wheat straw (47.5% TDN; NRC, 2001). Have There Been Any Feeding Trials with Eastern Gamagrass in Wisconsin? One research trial (Coblentz et al., 2012) has been conducted at Marshfield using EGG haylage as an alternative to straw forages. The trial was comprised of five dietary treatments that were offered to 120 replacement dairy heifers (715 to 935 lbs) for 105 days. Dietary treatments included a control TMR diet comprised of 53% corn silage and 47% alfalfa haylage, which was offered for ad-libitum intake (negative control). The negative control diet contained excessive energy for heifers of this size, and it was designed to allow excessive weight gain and over-conditioning. The same TMR diet also was evaluated on a limit-fed (positive control) basis at 85% of ad-libitum intake in order to control heifer growth rates. Three additional diets were constructed by substituting EGG haylage into the diet for corn silage such that EGG haylage comprised 9, 18, or 27% of the total dietary DM. Results of the trial are summarized in Table 1. As planned, the diet containing 53% corn silage and 47% alfalfa haylage was excessively energy dense (68.2% TDN), and dairy heifers gained too much weight (2.4 lbs/day) without restrictions on voluntary intake. Weight gains were reduced incrementally with substitutions of EGG haylage for corn silage, but it required about 27% EGG to attain acceptable weight gains (1.9 lbs/day) that were similar to industry recommendations, as well as those observed for the limit-fed diet (1.9 lbs/day). It is important to note that these results with EGG haylage were obtained by reducing both the energy density of the diet, and by reducing voluntary intake. As a result of these combined factors, heifers offered the diet without EGG for ad-libitum intake consumed 1.0 lb DM and 2.0 lbs TDN per day more than those heifers offered the diet containing 27% EGG. In addition to correcting heifer growth rates, the reduction in voluntary intake by including 27% EGG haylage represents a potential savings in feed costs to heifer growers. 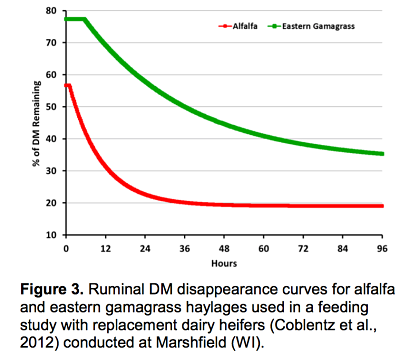 Did Heifers Sort Eastern Gamagrass Haylage? One of the most desirable observations from the feeding trial described previously was that heifers exhibited none of the sorting behaviors commonly associated with straw. It is possible that this response could be associated with the general similarity of precision-chopped silage crops within blended TMR diets. However, despite its high NDF concentrations, EGG has long been recognized as a highly palatable grass that is frequently grazed to exhaustion (death) within unmanaged fenced pastures. The excellent palatability characteristics of EGG may be related to the limited number of reproductive tillers (described previously), but also may be related to other factors. For instance, EGG is observed to exhibit a very (pleasant) distinctive odor during forced-air drying. Regardless, the absence of sorting behaviors commonly associated with chopped straw may make EGG an attractive alternative for management situations where there is inadequate bunk space for all heifers to eat simultaneously. If those conditions exist, a non-sortable, low-energy forage allows subordinate heifers to consume the same diet as aggressive heifers, thereby maintaining more consistent animal performance within modestly overcrowded pens. Coblentz, W. K., J. O. Fritz, W. H. Fick, R. C. Cochran, and J. E. Shirley. 1998. In situ dry matter, nitrogen, and fiber degradation of alfalfa, red clover, and eastern gamagrass at four maturities. J. Dairy Sci. 81:150-161. Coblentz, W.K., W.E. Jokela, P.C. Hoffman, and M.G. Bertram. 2010. Unique dairy applications for eastern gamagrass in central Wisconsin: II. Nutritive value and energy density. Agron. J. 102:1720-1730. Mention of trade names or commercial products in this article is solely for the purpose of providing specific information, and does not imply either recommendation or endorsement by the U.S. Department of Agriculture.